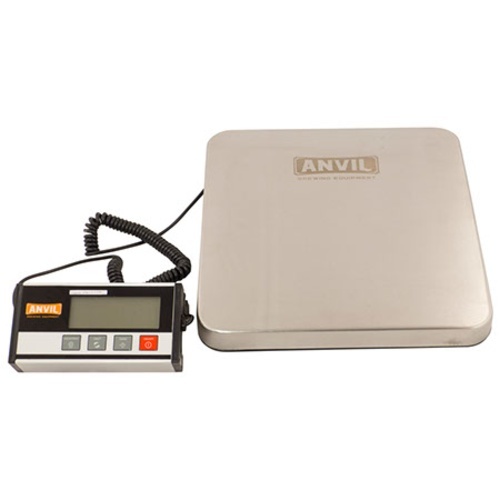 Handling up to 65lb of grain, this large scale from Anvil can measure big bags of grain with a 0.02lb accuracy. The large 12.5" x 11.75" weighing surface supports almost any size bucket or container. 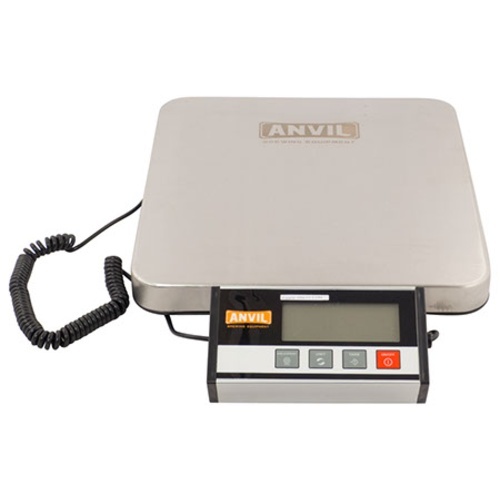 The remote LCD is movable and mountable allowing you to put it in the most convenient place to see the weight in either pounds or kilograms. Need large scale to weigh honey for making mead as I pour it into my Fermonster 7 gallon carboy. to weigh grain and kegs while closed transfer filling. To weigh my grain as I'm migrating to an all-grain setup. what is the lowest amount of weight this can accurately be used to measure and does it have other settings besides lbs such as oz, grams, liquid oz, or others? BEST ANSWER: The settings only have a reading for pounds and kilograms. 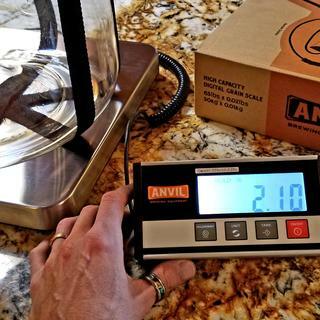 This scale is awesome for taking the leap from small batches to 5-7 gallon batches. It measures accurately, has ability to permanently disable the auto-shutoff in configuration so that it stays on until YOU turn it off. Once you set the manual-shutoff mode, you never have to think about it again. There is also a hold button so that you can weigh something, press the hold button, then remove the object from the scale while the display stays locked showing the weight as it was when you hit the hold button. Also, a 7 gallon Fermonster fits on it perfectly on it. What more could you want?! 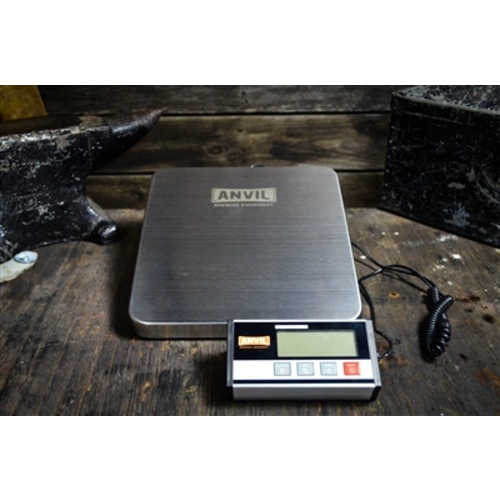 This is a photo of the large Anvil scale in with a 7 gallon Fermonster on it. The scale is not particularly accurate. With nothing on it after tearing it, the weight fluctuates. Works great so far. First job was weighing kegs while pressure transferring beer from chronical to keg. Be sure and read the directions to set parameters. I noticed some one had trouble with it turning off while in use. That is one things you have to choose it to do or not in the settings. Just recently picked this scale up and it is a solid unit. The only down fall I could find is when measuring anything under 6lbs. I would get a large varible with light weight. To correct this I measure base grains then move to spacilty grains. This could also be corrected by using a heavy bin if measuring anything sub 6 lbs (total weight on scale). With that being said I still recommend this item.